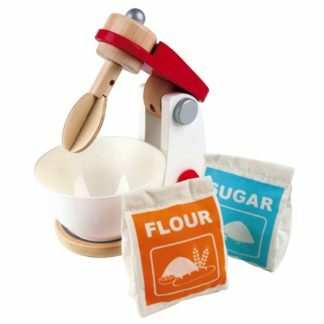 Hape Play Kitchen and food sets are quality wooden toys for children 3 years and up. The sets are safe and simple toys which revolve around food and cooking. Designed to promote realistic role play and encourage healthy eating. 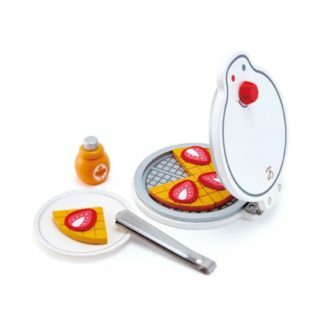 New Play Kitchen additions to our store. We are pleased to introduce the latest Hape Play Kitchen sets… All of the new sets are in stylish white and red design, complementing each other beautifully. The Cook & Serve Set has everything your child needs to cook a delicious meal for family and friends. This 13 piece set comes complete with pot, pan, plates, knives, forks, cooking utensils and even little salt and pepper pots. Every kitchen needs a coffee machine. 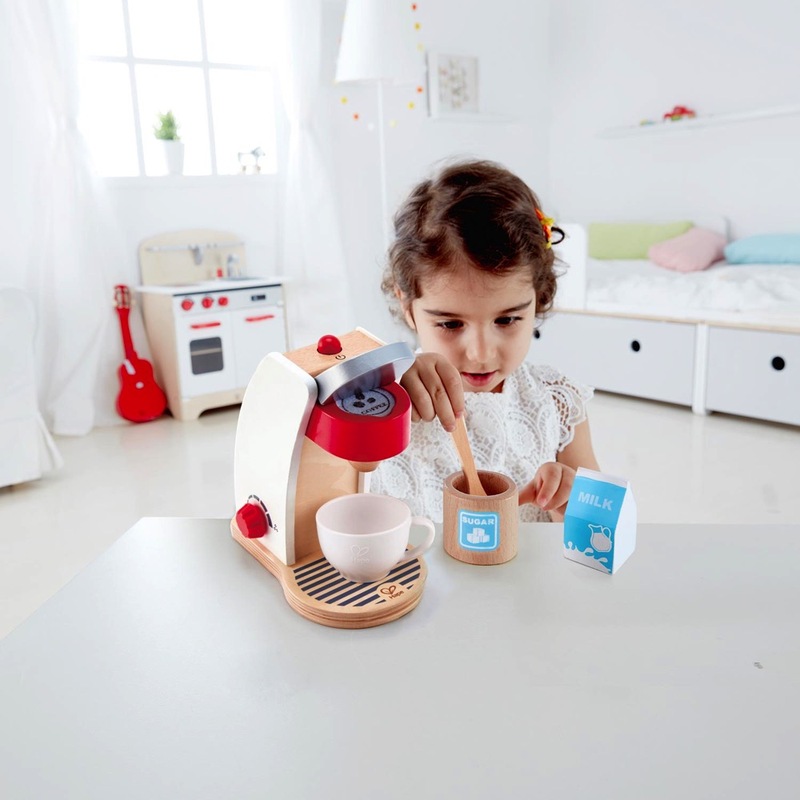 The Hape coffee machine comes with all your child needs to brew up the perfect coffee. 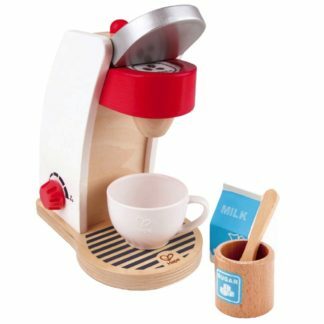 Stylish coffee machine with adjustable dial, coffee pod, cup, spoon, milk and sugar. Your child can pretend to make fabulous cakes and treats for family and friends with the help of Hape’s Mix & Bake Blender. The turntable blender comes with pretend bags of flour and sugar. Just add imagination. Everyone loves waffles. Children can make their own with the Hape My First Waffle Maker. Bake the waffle, add strawberry slices and maple syrup. The perfect recipe for a make believe breakfast. Benefits of role play toys. Hape Play Food Sets are a great way to encourage your child to be creative. It is such a pleasure to see them absorb themselves in a world of make-believe. Most young children spend a lot of time at home in their early days. As such they watch adults engage in household activities, such as cooking from a very early age. Naturally, youngsters learn from watching others. But they learn can learn much quicker if they are actually able to get involved. Of course, it is not always practical or indeed safe to let your little one assist you in the kitchen. Role play toys allow your child to recreate everyday household tasks. But in a safe, age-appropriate and imaginative way. Toys that encourage role play are no doubt great fun. But they also help children to develop vital communication and social skills. 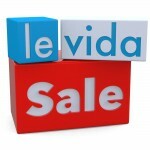 Previous post: Save 50% on Papo cardboard playsets when you spend over £25.00.